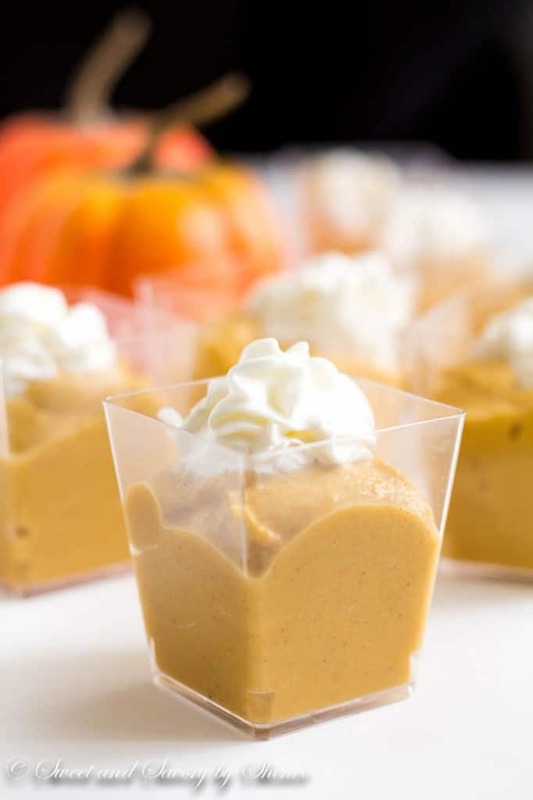 This creamy homemade pumpkin pudding from scratch is easier than you think. Forget about the boxed stuff, this homemade version is much tastier! Loving this fall season filled with apples, pumpkins, and winter squashes. Everything infused with cinnamon sounds delicious too. And it’s the perfect time to make all sorts of comforting food, like chicken potpie and scalloped potatoes. Cool and crisp mornings are perfect for a long walk. There is really nothing not to love about fall. Do you feel the same way? I know, I’m writing this post a bit late today. I’ve been really busy in the kitchen roasting some pumpkins, baking pumpkin mousse pie and testing some delicious apple recipes. Oh, what a day I had. So much fun in the kitchen! 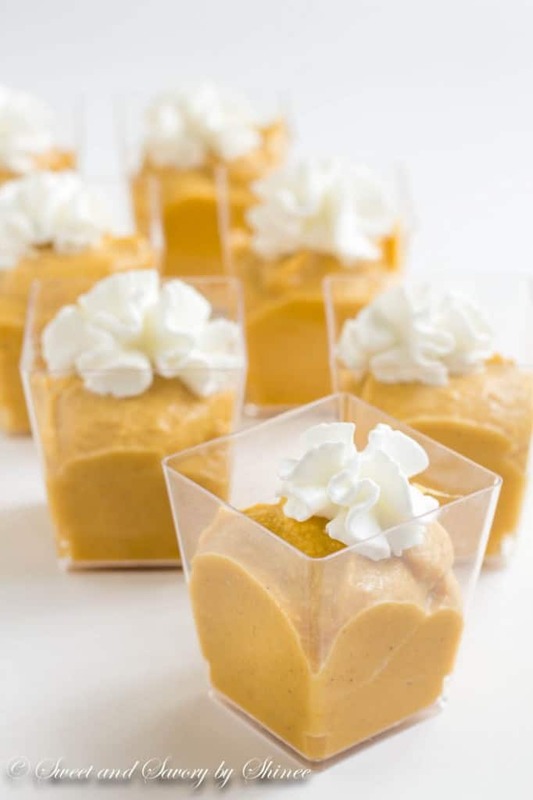 To celebrate all things pumpkin, I made this deliciously light and creamy pumpkin pudding. 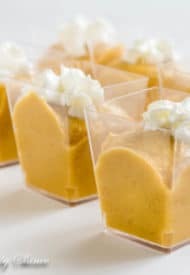 I used my basic vanilla pudding recipe as a starting point, added some pumpkin puree and spices and got an amazing pudding packed with fall flavors. 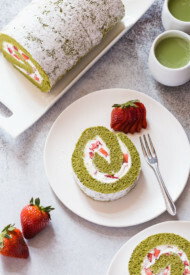 It’s such a light and flavorful dessert, perfect after heavy holiday dinner. 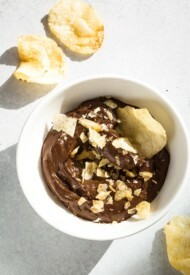 Homemade pudding from scratch is actually easier than you think and way tastier! It’s super simple to make, but it does require a little time compared to boxed pudding, but hey, it’s better than box of preservatives, additives, and god knows what else! And the final product is superior to say the least. I hope you include this recipe in your must-try list this season. I know you will love it. With leftover egg whites, you can make this delightful Pavlova cake, or these pumpkin macarons. Apples or pumpkins? Which one you like more? 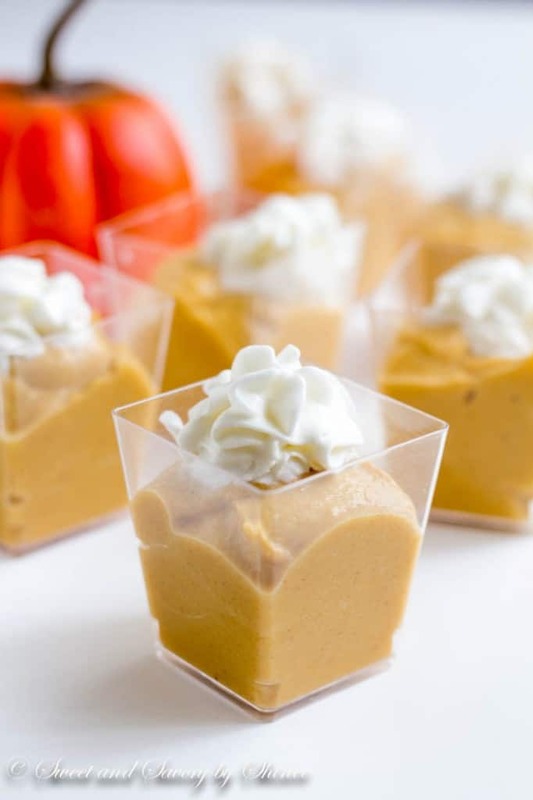 This creamy homemade pumpkin pudding from scratch is easier than you think. Forget about the boxed stuff. In large saucepan, heat the milk and heavy cream. Don’t boil it. 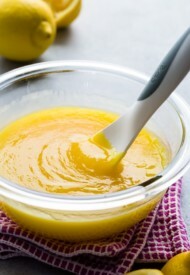 In a medium bowl, whisk egg yolks and brown sugar together until thick and pale, about 3 minutes. Add maple syrup, cornstarch, vanilla extract, cinnamon, allspice, nutmeg and salt. Whisk until well combined. Then mix in the pumpkin puree. To temper the egg yolk mixture, take about 1 cup of hot milk and add it to the egg yolk mixture, whisking vigorously. (If you stop whisking when you add the hot milk, it will cook the egg yolks!) Stir in another cup of hot milk and then transfer the tempered egg mixture to the remaining hot milk. Over medium heat, cook the pudding for 8-10 minutes stirring with a wooden spoon. The mixture will thicken 5 minutes into the process. Slowly stir the mixture to prevent the custard to burn on the bottom. Once thickened, remove from heat and run through the fine sieve. Cover with a plastic wrap and cool to room temperature. Then chill in the refrigerator for at least 1 hour. Does the mixture continue to thicken once cooled? I followed directions and the end mixture seems watery still. Hi, Baida. Yes, it does thicken as it cools. When the mixture bubbles, did you see thick bubbles like shown in my pictures above? Hope it turns out good. When did you add the maple syrup? Or is it whipped with the cream for the topping? Hi, Christie. So sorry for confusion. Maple syrup should go in with cornstarch, vanilla extract and spices. I just updated the recipe. Thank you for asking! I love making homemade pudding, and this pumpkin version looks great. I’m gonna need at least five of those tiny cups, though. 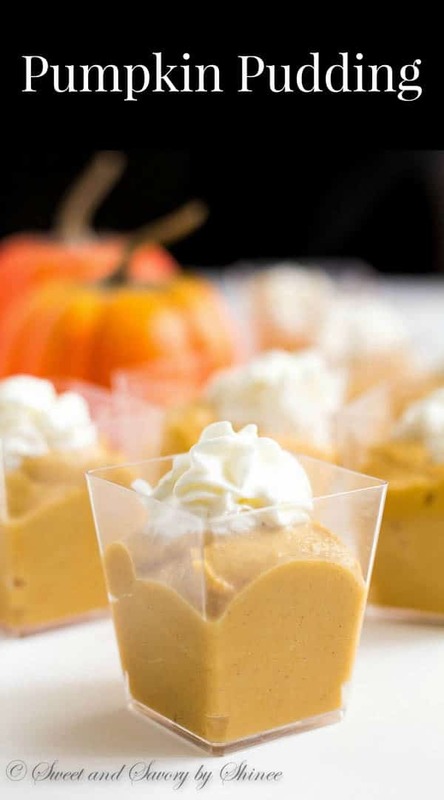 These pumpkin pie puddings look so delicious.. wish I had one to devour right now. Especially loving that layer of whipped cream topping too. Great recipe!